A few moths ago Skin18.com sent me a few of their samples to try. I was more than excited to try them, and today I am writing to share my experience about them. I was sent the below products. This was the first mask I tried. The moment I put it on my face, it felt cool and relaxing. I was so relaxed, that I was ready to sleep after a long day at work. After the mask is taken off, it leaves a residue on your face, which you can massage into your skin. I didn't see any visible results the moment I took the mask off. Even the next day, I didn't see any visible results. But my skin felt soft. 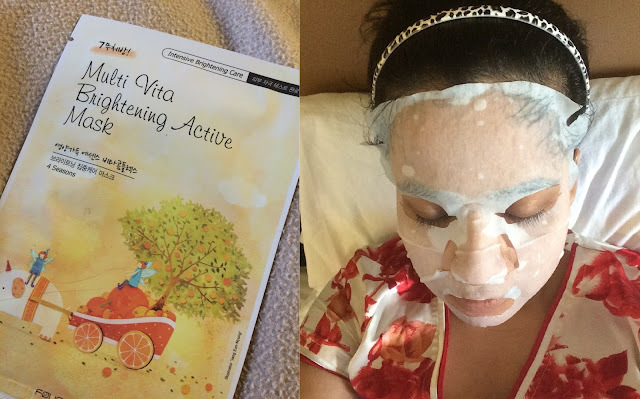 Then after a few days I tried the Pearl Shining Hydrogel Mask. I had also introduced the syringes into my skin care regime. The mask was different from the previous one I had used. It was transparent and clung to my skin. I rubbed the the extra liquid in the pack on my hands as well. Again no visible effect on my face after I took the mask off. But the next day, my face looked fresher. I was really excited to try this mask for obvious reasons. The mask sheet was a thick paper and felt cool too. But again the results of this mask didn't amaze me. I was getting impatient. Because all my blogger friends were going gaga over Skin18.com's products and I was yet to find me eureka moment. I took a break from the masks for a few weeks, while I continued using the syringe serums. Then, I started using the masks again with zero expectations. First the Collagen mask, then the Snail Repairing Wrinkle Care Intensive Mask and then the Tea Tree care solution mask. Surprisingly I started feeling that my skin looked better and better with each application. But my eureka moment arrived when I used the TeaTree Relax solution. When I completed this 3 step process, my face was glowing and looked several shades lighter. If this is what the mask did in one use, I wonder what this mask would do with regular multiple applications. My Verdict: Skin18.com products are not for people who expect overnight miracles. Their products are of extremely good quality and have been thoroughly tested in laboratories. They work if you use them regularly and with patience. They give slow, but sustainable results. Skin18.com has helped my skin a lot and hence I would recommend it to everyone. Have you tried Skin18.com yet? Let me know in the comments below. These masks look so innovative! Glad you found your eureka moment at last!